I captured these yellow road lines yesterday –behind the fence. 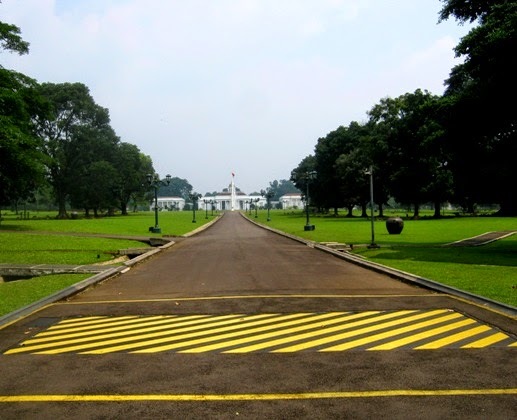 They are not ordinary lines as the road leads to the main building of Bogor Presidential Palace (Bogor, West Java, Indonesia). Perhaps the yellow spot is an area for checking every coming vehicle. I think the gate is only open for the VVIP. The palace has several entry gates. I have never seen angled yellow lines like this. They do seem to be some kind of warning. Nothing like different type of yellow lines to catch your attention ... Interesting set ... what do they mean specifically? Maybe you have to walk in zig zags over the street ? does the palace open for the public on National Day?